I was going to give you a super-easy and healthy-ish, ice cream recipe, inspired by my recent trip to Spain. Miss R even had a crackin’ tune all planned out, a real belter. But the sloppy slap of rain against the conservatory roof put me in a baking mood. Not a cake baking mood but a full-on comfort extravaganza, involving batter. 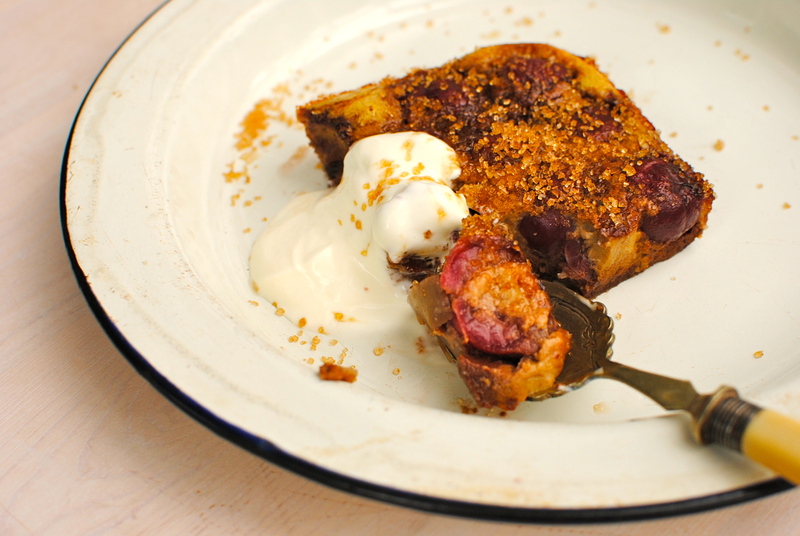 Batter-based clafoutis is, according to Nigel Slater, the only hot pudding acceptable in summer. I quite agree. Menus featuring sticky toffee puddings and hot chocolate fondants seem somewhat disagreeable when the mercury is nudging 30C. Like wearing a fur coat on the beach. I would imagine. To quell my baking fixation, as luck would have it two packs of English cherries were hiding in the fridge, their plastic carapaces not yet be breached by snack-seeking fingers. So I thought – lightbulb moment – clafoutis. But clafoutis with a – turning up the dimmer switch – dark side. I am not normally a fan of clafoutis. I find they can be a wee bit bland and a tad eggy for my liking. But I realise that I am an exception because this delicate custardy pouf of a pudding, from the Limousin region in France, is exceedingly popular. Partly this is to do with ease: after stoning the cherries it scarcely takes more than five minutes to put together and whack in a moderate oven. No tricksy separating of eggs or out-there ingredients either. But I also know it is to do with blanketing a short season fruit in a deep duvet of comforting, billowing batter. Who in their right mind doesn’t like things in batter? Just a whisper of flour and sugar, some fruit, eggs and milk and you have a magnificent pudding that needs only a serving spoon and perhaps some cream. So, I thought I would set about making a clafoutis that suited me. Hopefully you will like it too. Sweet cherries are traditional in clafoutis (yes, the ‘s’ is supposed to be there), and I’ve used deep garnet beauties from Herefordshire in England, but I will try this again with slightly sharper blackcurrants. And then later with some blackberries, whenever these start appearing in the nearby woods. Plums, pears, raspberries, nectarines and apricots would work well too. Interestingly, using fruit other than cherries makes this a flaugnarde. But I don’t even know how to say that convincingly so I will just call my riffs clafoutis, and pedantry be damned. 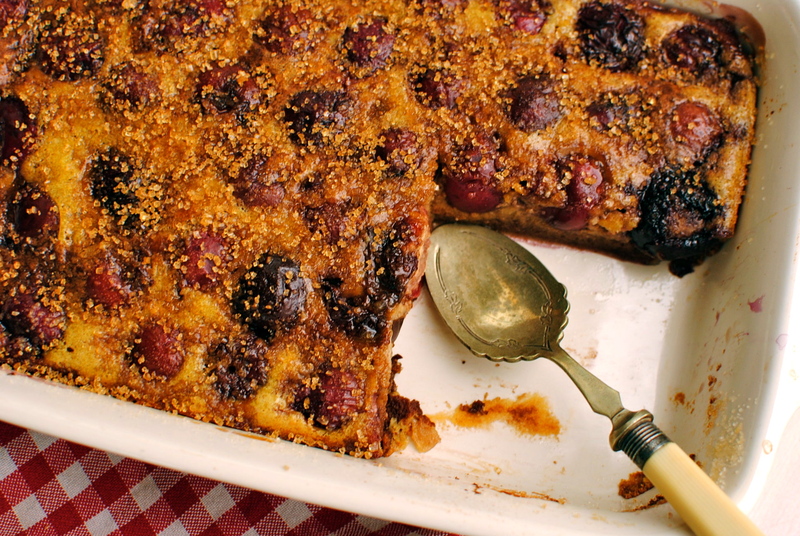 Another traditional feature of clafoutis is leaving in the cherry stones. This odd interesting practice is said to impart a subtle almond flavour, complementing the cherries. Tradition is fine but I don’t fancy any more attention from the medical profession than I have already – or a trip to the dentist – so I remove them. And this is easily done if you have a cherry stoner/olive stoner. I’ve got a vintage one (ie one my mother used to use) but Lakeland have one that looks similar. But I didn’t want to forgo the almond note so I have used some freshly milled almonds in the batter, and you have the option of using almond milk rather than dairy (I didn’t have any but I think it would work just fine). You could even add a few drops of almond extract if you like. Cherries last but a few short weeks here in Blighty so I am getting my fill while prices are almost reasonable. I have yet to see them in farmers’ markets up here in Scotland but I bet they are pride of place in the markets of southern England. Where today I hear it’s heading towards a spaghetti straps 30C. Regular readers will know what I am wearing today. And it ain’t spaghetti straps. Nutrition Bit: Sweet cherries are rich in beta carotene, vitamin C, anthocyanins and quercetin, which may work together synergistically to fight cancer. Plus, preliminary studies suggest the anthocyanin cyanidin may prevent genetic mutations that can lead to cancer and keep cancer cells from growing out of control. While tart cherries contain some anthocyanins, sweet cherries pack nearly three times as many (two-thirds are found in the skins). 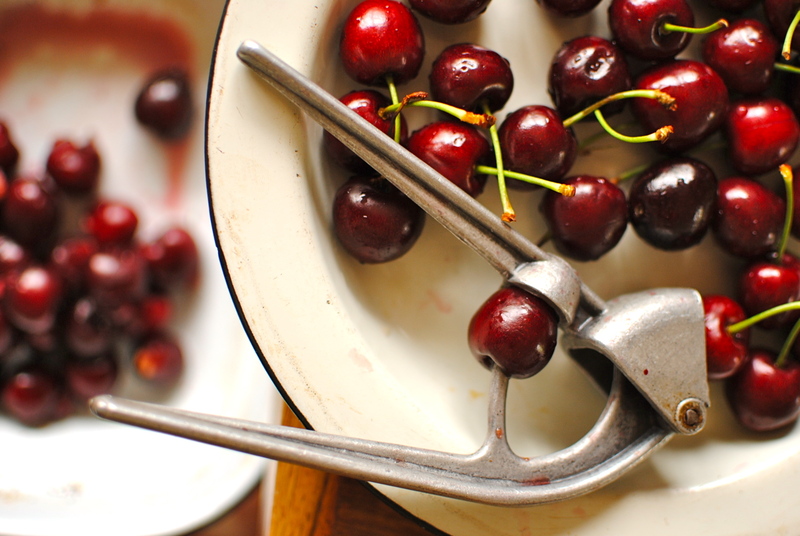 The riper the better: as cherries darken, they produce more antioxidants (from eatingwell.com). Along with other deeply coloured blue and red fruits, cherries are a top anti-ageing food, as well as being a potent cholesterol fighter. Ten cherries make a portion, and deliver a mere 90 delicious calories. I am entering this seasonal recipe into Ren Behan’s Simple and In Season recipe link-up, this month hosted by Fleur. I’m a late entry but I may just make it! Miss R’s Track of the Week: ‘Cherry Wine’ by Nas, featuring Amy Winehouse – hot off the press. This is a bit rude and has some ‘language’ so you have been warned… A hot, humid evening, sloping around kind of song. Lovely vocals from Ms Winehouse. This très facile recipe is sweet(-ish), squidgy summer comfort food at its best. Although cherries are traditional, for a real contrast of flavours, and a pleasing pop on the palate, try ebony, piquant blackcurrants instead. 1. If you are using the brandy or kirsch, soak the cherries in it for a couple of hours at room temperature. 2. Take a small ceramic or enamelware dish – about 20 cm – butter it and sprinkle with about 1 tbsp of caster sugar, shaking it around until it is evenly coated. This is an optional step but I think it enhances the texture. Add the cherries in an even layer. 3. Heat the knob of butter in a small pan until it turns a golden, nutty colour. Careful it doesn’t burn. Remove from the heat when it reaches the right colour. 4. In a double boiler or microwave, heat 60 grams of chopped chocolate until just melted. If using a double boiler set the top pan over barely bubbling water until it looks partially melted, then give it a stir. If using the microwave, follow your machine’s instructions or proceed in 10 second bursts until the chocolate is starting to soften, then stir. What you don’t want to do is see it melt completely or it will seize up and go horribly grainy – eew. Set aside. 5. In a mixing bowl whisk together the eggs, maple syrup and vanilla until foamy. Fold in the flour, then whisk in the milks, salt and melted butter. 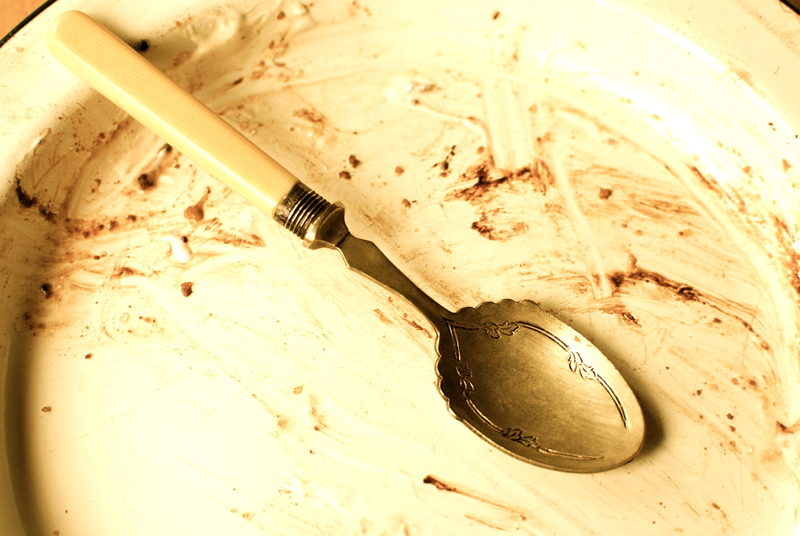 Take away one third of the batter to a small bowl and whisk in the melted chocolate. Pour most of this mixture over the cherries, followed by the ‘plain’ batter, then the remaining chocolately batter. Sprinkle over the remaining chopped chocolate. Pop the dish into a 180C/350F oven and bake for 25-30 minutes, or until slightly pulling away from the sides and a skewer or knife comes out clean. Let the dish cool for five minutes before serving the clafoutis warm with sprinkled over Demerara sugar and a dollop of crème fraiche or cream. is the best thing I’ve read today! It’s so melodic and descriptive – I want fruit in a deep duvet of comforting, billowing batter! A whisper of flour and sugar? Yes please! Love your super-kind comment! I had fun making and writing this post and I am thrilled that it may inspire you to make this easy-as recipe. Hubby just gobbled down the remains that had been sitting out all day, daring me to finish it off. No more temptation now. Phew! This sounds absolutely divine! Thanks to your beautiful pictures my mouth is officially watering. Your tasty recipe is enough to make me splurge on end-of-season cherries here in Los Angeles. Thanks for sharing! Well don’t use them ALL on the cherry chocolate clafoutis 😀 thanks for your lovely words. 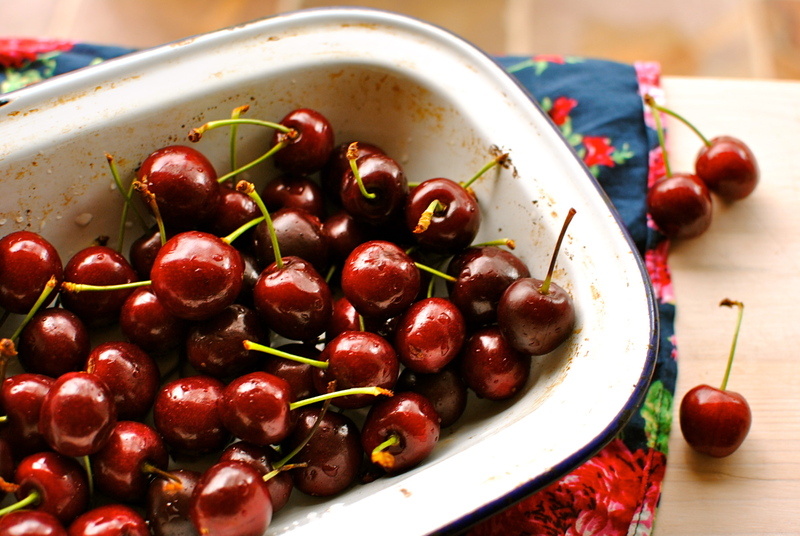 A lovely indulgence for the short cherry season! I do enjoy the vibrant fruits of summer and a sweet dessert is the ultimate celebration. Your scrumptious clafoutis is just perfect! Aw, bless. Thanks for your sweet feedback & pinning me for your zillions of followers. I am such a slacker on the pinning front . Must remedy that ASAP ! Anyway, this looks delish as usual so thanks for sharing it. I didn’t see the news but that doesn’t shock me. Sad to think it’ll all just rot on the soaked soil. Raspberries will be perfect with your g-f flour batter. Let me know how it turns out for you, okay? Will do. Going round to sis on Fri for some paella (they are inspired after their Spanish trip) so I will bring the pud. Yay! I am sure it’ll look prettier than mine. Lol! Yay! I am sure it’ll look prettier than mine. Lol! Btw, making blackcurrant & raspberry jam and the house smells heavenly. My fave jam. Will be using it as is and in a granola biscuit recipe. It’s always a darn shame that cherries have such a short season. Have to get my “fix” quickly! Thanks for stopping by Alyssa. You are incredibly lucky to have cherries ‘coming out the wazoo’! Thanks Rosie. Do I detect that you don’t fancy cherries? Plum would be good. Hope you are doing well m’dear. Wow!! This dessert looks amazing. They are selling local cherries just down the road from me at the moment. I might have to pop in and get some now that I have seen this. Thanks for entering Simple and in Season. 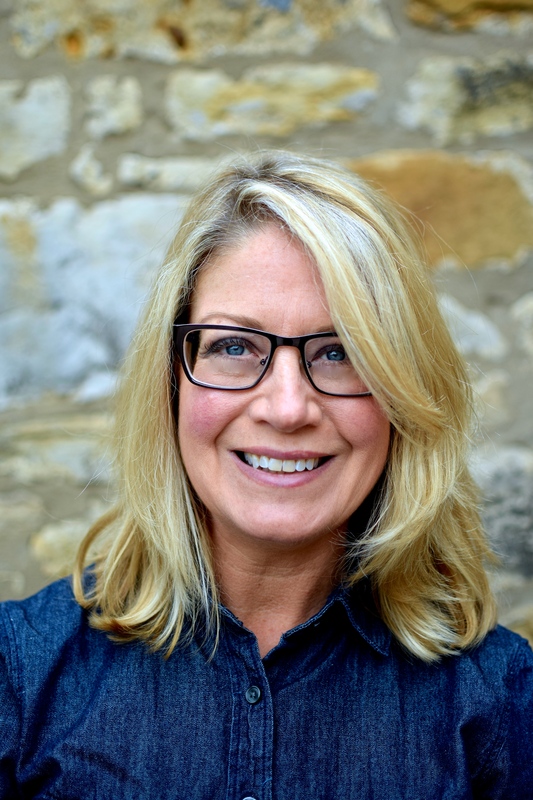 Thanks so much Fleur, for the comment and for hosting Simple and In Season. So many fantastic entries! Oooh, this looks like the perfect treat to whip up with all the loads of cherries I’ve been buying! (That is, if I can stop eating them out of hand long enough to actually make them into something, lol!) Absolutely gorgeous. I think the best way to eat cherries is straight as they come, but when it is the middle of cherry season I think this is quite nice to make. 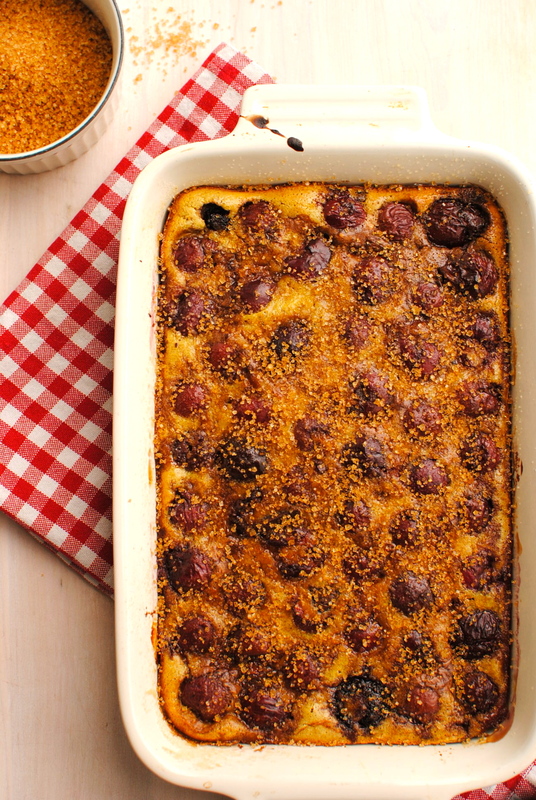 So easy and a little different to the regular clafoutis (which is nice too). Oh your clafoutis sounds good too. I like that you’ve used agave, what a good idea. I have a bottle in my cupboard that I only remember occasionally, even though I’m full of good intentions.